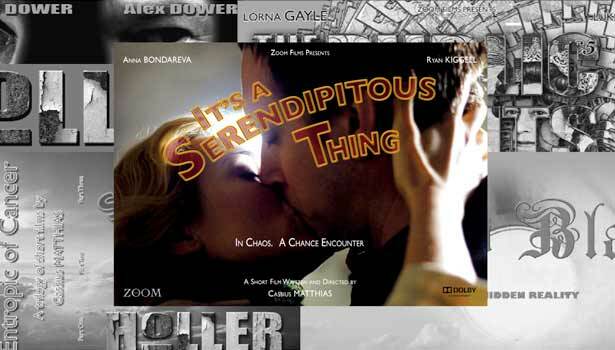 It’s A Serendipitous Thing is a contemporary romantic love story. Marcel (Ryan Kiggell), an American expat down on his luck and Lena (Anna Bondareva), a beautiful unemployed Russian, are mutually attracted during a chance encounter at a bus stop. As Marcel and Lena get to know each other over tea and cake, the future lovers see that they both have the same infinity-symbol tattooed on their wrists. And so it transpires that serendipity marks their destiny. Annette Badland (Landlady), Erguz Behloul (Chess Player), Nikki Bennett (Red Clown/Girl with Balloons), Anna Bondareva (Lena Orlova), Alex Dower (Alex), Philip Elvy (Blue Clown), Joe Fox (BMX Rider), Miles Harrison (Disgruntled Customer), Ryan Kiggell (Marcel), Artem Kotov (Busker), Nic (Hand Artist). A Zoom Films presentation. Produced by Cassius Matthias. Associate Producer, Avy Andrews. Directed by Cassius Matthias. Screenplay, Cassius Matthias. Camera, Peter Butler; editor, Miikka Leskinen; music, Miguel Mera; production designer, Hauke Richter; costume designer, Eleanor Baker; hair & make-up designer, Sue Wyburgh; sound, Gareth John; sound editor, Richard Fordham; re-recording sound mixer, Jamie Roden; assistant director, Ohna Falby. Carhartt BMX Team rider, Joe Fox, on the “Tunnel of Love” set rehearsing a stunt, above left. BRB at The Gate, Alexandra Palace, above centre, was chosen for its 1875 period pub interior with massive windows giving views of the randomness of life on the street.